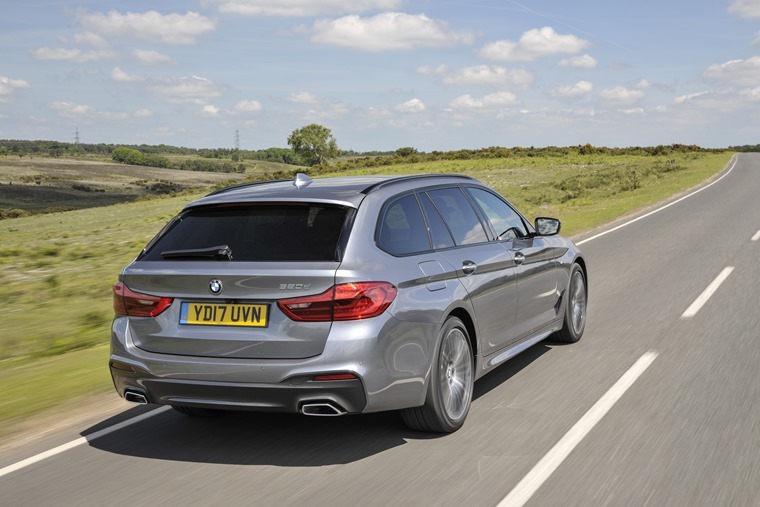 Roomy while delivering a drive that’s every inch as good as the saloon’s, the BMW 5 Series Touring has it all. The ideal executive estate. The BMW 5 Series has always enjoyed an edge over its rivals in saloon form thanks to its sporting appeal. 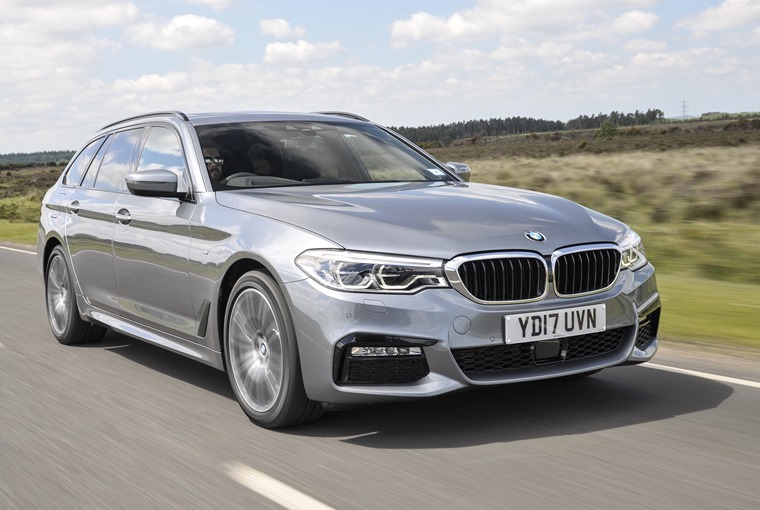 As an estate, or Touring in BMW parlance, it’s not enjoyed such an advantage, so does this latest generation have what it takes to topple the Audi A6 Avant, Jaguar XF Sport Brake, Mercedes E-Class Estate and Volvo V90? That’s a tough set of competitors as they all perform very well in all key areas, but as we’re talking about wagons, let’s start with space and practicality. 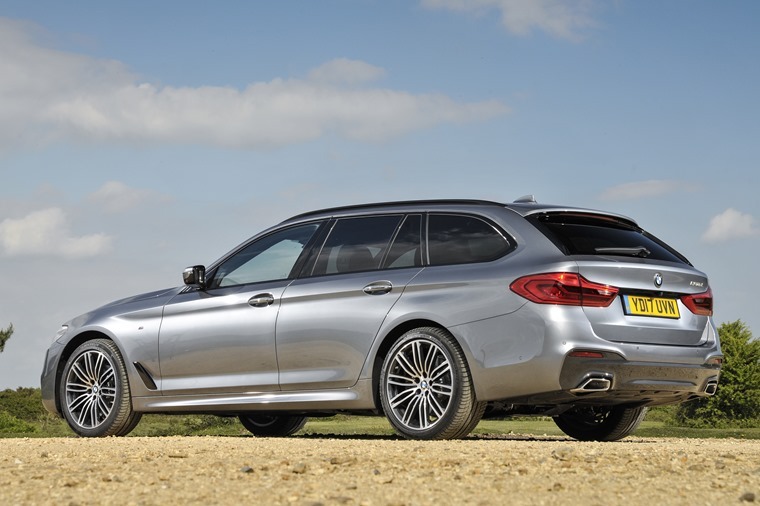 This 5 Series Touring comes with 570-1700 litres of load space, which is more than its predecessor by a small margin. Compare that its competitors and it has a greater luggage capacity than the Audi, Jaguar or Volvo, but the Mercedes is some way in front with 670-1820 litres. Folding the rear seats in the BMW is easy as the backs are light to tip forward and they’re split 40-20-40 rather than the more usual 60-40. This gives the 5 Series a little more versatility, especially when you want to keep child seats in place but need the extra length for those inevitable trips to the DIY store. 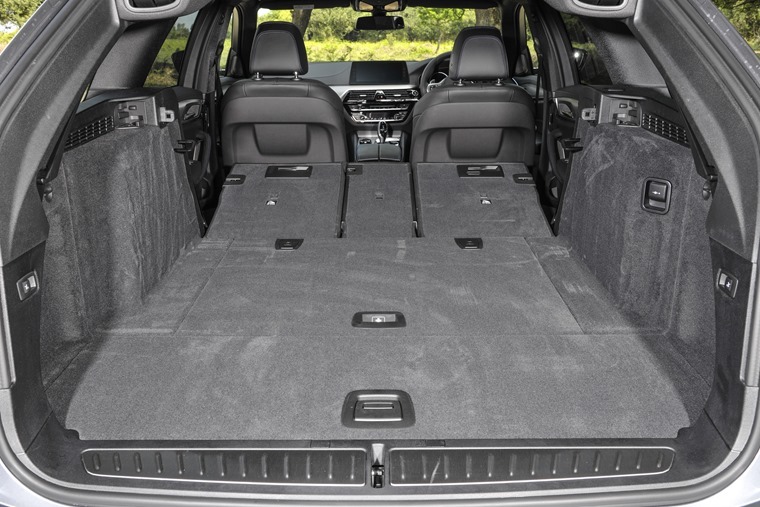 Other appealing features with the BMW that come as standard on all Touring models is the powered tailgate, and there’s some hidden storage under the boot floor big enough for a laptop or handbag. The shape of the 5 Series’ boot is another positive for this model as it’s long, rectangular and not interrupted by wheelarches or other lumps and bumps from the bodywork. The result is you can slide in wider loads with no hassles and when you fold the rear seats there’s a long, flat load floor. Other appealing features with the BMW that come as standard on all Touring models is the powered tailgate, and there’s some hidden storage under the boot floor big enough for a laptop or handbag. When you open the tailgate, the load cover automatically retracts, so you don’t have to fiddle with latches. It also slides back down when you close it again. So, it’s big and useful in the boot, but what about in the rear seats? As an estate, it’s likely the Touring will be used by those with families and here it breaks with its long-running tradition of providing not quite enough legroom for adults. Instead, two fully grown adults can sit in complete comfort back there and there’s also good vision out. For anyone who finds themselves riding in the middle seat in the back, it’s a less joyful experience. The cushions are narrower than those for the other two seats and the base has unusual scallop that digs into the bottom of your spine after a few minutes. You do get a three-point seat belt, but it’s definitely a get-to-the-shops only option. 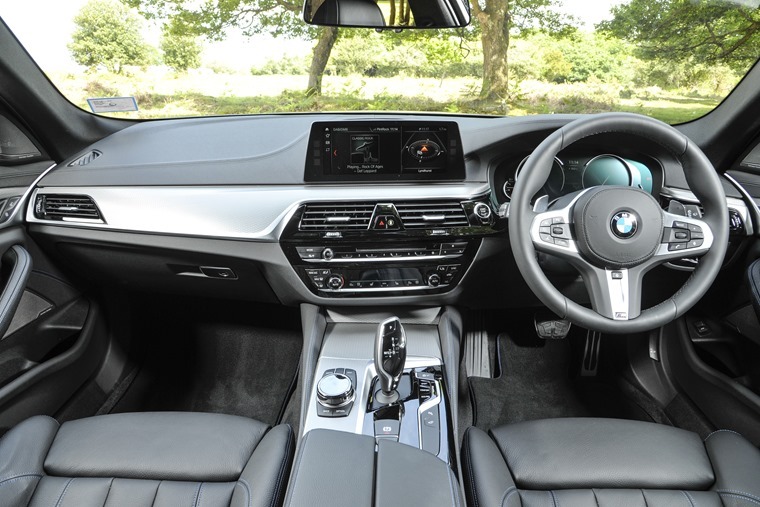 Up front, the dash, driving position and comfort are exactly the same as in the saloon 5 Series. In other words, they’re all superb and this is an extremely classy place to find yourself on any trip. The main dash display uses digital instruments rather than analogue ones and they’re easy to read and configure. It’s the same with the centre console’s large touchscreen which is easier to work using the iDrive controller in the middle of the transmission tunnel. BMW has made a great job of simplifying this so it’s now easily one of the most intuitive infotainment set-ups of any car. All-round vision is good for the driver and you have parking sensors front and rear to warn of impending danger of damage. A 360-degree camera is also an option and worked very well on the cars we tried. 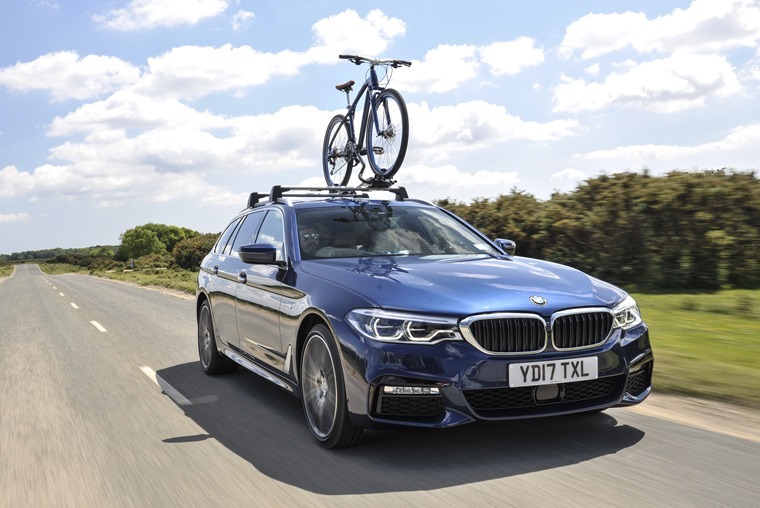 So, the touring works as an estate and family car, but what about as a BMW? That badge raises certain expectations about driving manners, but it’s safe to say this latest Touring doesn’t just maintain the high bar set by its predecessor it raises it by quite a margin. The latest Touring doesn’t just maintain the high bar set by its predecessor it raises it by quite a margin. You can have the usual rear-wheel drive set-up or xDrive to send power to all four wheels. Unless you find yourself on some very slippery roads, you’ll not notice the difference. What you will notice is a superb ride quality in the SE models. Opt for the M Sport and there’s a little more firmness but not enough to put us off choosing this version with its more aggressive styling. Or, you can have the M Sport and delete the firmer suspension at no cost. One option we would add as a matter of course is the adaptive dampers that let you stiffen up the suspension whenever you want. It introduces a lithe agility to the Touring that not even the Jaguar XF can match, which coupled with the BMW’s excellent steering response makes it the leader of this group in the driving stakes. As for the engines, you have the choice of 530i, 540i and 530e with petrol power. Of those, the hybrid will be of most interest to business users, but if you’re stuck in your ways there are the diesels in the form of the 520d, 525d and 530d. We jumped into the 530d expecting it to leave all others feeling a little feeble by comparison. However, there was a slight rumble from the engine and the turn-in to corners shows up the weight of that six-cylinder motor in the nose of the car. It’s quick and the eight-speed auto is super slick, but it doesn’t feel like the best bet anymore. That accolade goes to the 525d. It uses the same 2.0-litre turbodiesel as the 520d but with 231hp on tap instead of 184hp. That allows it to see off 0-62mph in 6.8 seconds while returning a combined economy of 60.1mpg and 124g/km CO2 emissions. Take the 520d and from rest to 62mph takes a second longer, but you do benefit from 65.7mpg and 114g/km, so it will no doubt find huge favour with fleet managers. Whichever of these two less potent diesels you choose, they are more refined than the 530d and you never feel short-changed for performance. Pick one of this pair and you have the ideal executive estate. It may not have the cavernous space of the Mercedes E-Class wagon, but it’s still more than roomy enough while delivering a drive that’s every inch as good as the saloon’s.